In the 1930s, the southwestern Great Plains suffered a series of severe droughts. Overfarming and overgrazing had destroyed prairie grasses, making the topsoil even more vulnerable to strong winds. NASA scientists now say that one of those drought years, 1934, was the driest and most widespread in a millennium. An estimated 100 million acres were turned into wasteland during the Dust Bowl, which contributed to the Great Depression's bank closures, business losses, unemployment and other physical and emotional hardships, as vividly chronicled in John Steinbeck's classic novel, The Grapes of Wrath. The first drought to hit the U.S. in 1930-31 created 14 dust storms in 1932, followed by 38 in the next year. Farmers, however, continued plowing the land, believing that rain would return. Instead, they got the 1934 drought, which severely impacted 27 states. As it turns out, the successive dust storms were making the droughts even worse. Using a tree-ring-based drought record from the years 1000 to 2005 and modern records, scientists from NASA and the Lamont-Doherty Earth Observatory have discovered that the 1934 drought was 30% more severe than the runner-up drought (in 1580) and extended across 71.6% of western North America. By way of comparison, the average extent of the 2012 drought was 59.7%. "It was the worst by a large margin, falling pretty far outside the normal range of variability that we see in the record," said climate scientist Ben Cook at NASA's Goddard Institute for Space Studies. Two sets of conditions led to the severity and extent of the 1934 drought. First, a high-pressure system in winter sat over the west coast of the United States and turned away wet weather— a pattern similar to that which occurred in the winter of 2013-14. 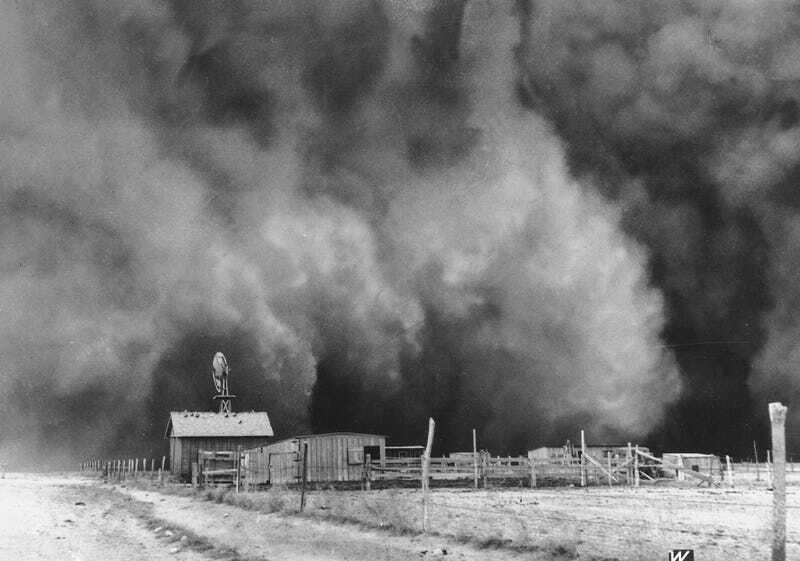 Second, the spring of 1934 saw dust storms, caused by poor land management practices, suppress rainfall. "In combination then, these two different phenomena managed to bring almost the entire nation into a drought at that time," said Richard Seager, professor at the Lamont-Doherty Earth Observatory of Columbia. "The fact that it was the worst of the millennium was probably in part because of the human role." According to the recent Fifth Assessment Report of the Intergovernmental Panel on Climate Change, or IPCC, climate change is likely to make droughts in North America worse, and the southwest in particular is expected to become significantly drier as are summers in the central plains. Looking back one thousand years in time is one way to get a handle on the natural variability of droughts so that scientists can tease out anthropogenic effects— such as the dust storms of 1934. "What you saw during this last winter and during 1934, because of this high pressure in the atmosphere, is that all the wintertime storms that would normally come into places like California instead got steered much, much farther north," Cook said. "It's these wintertime storms that provide most of the moisture in California. So without getting that rainfall it led to a pretty severe drought." This type of high-pressure system is part of normal variation in the atmosphere, and whether or not it will appear in a given year is difficult to predict in computer models of the climate. Models are more attuned to droughts caused by La Niña's colder sea surface temperatures in the Pacific Ocean, which likely triggered the multi-year Dust Bowl drought throughout the 1930s. In a normal La Niña year, the Pacific Northwest receives more rain than usual and the southwestern states typically dry out. But a comparison of weather data to models looking at La Niña effects showed that the rain-blocking high-pressure system in the winter of 1933-34 overrode the effects of La Niña for the western states. This dried out areas from northern California to the Rockies that otherwise might have been wetter. As winter ended, the high-pressure system shifted eastward, interfering with spring and summer rains that typically fall on the central plains. The dry conditions were exacerbated and spread even farther east by dust storms. "We found that a lot of the drying that occurred in the spring time occurred downwind from where the dust storms originated," Cook said, "suggesting that it's actually the dust in the atmosphere that's driving at least some of the drying in the spring and really allowing this drought event to spread upwards into the central plains." Dust clouds reflect sunlight and block solar energy from reaching the surface. That prevents evaporation that would otherwise help form rain clouds, meaning that the presence of the dust clouds themselves leads to less rain, Cook said. "Previous work and this work offers some evidence that you need this dust feedback to explain the real anomalous nature of the Dust Bowl drought in 1934," Cook said. Dust storms like the ones in the 1930s aren't a problem in North America today. The agricultural practices that gave rise to the Dust Bowl were replaced by those that minimize erosion. Still, Seager says, agricultural producers need to pay attention to the changing climate and adapt accordingly, not forgetting the lessons of the past. "The risk of severe mid-continental droughts is expected to go up over time, not down."